Riot police try to arrest members of the "Stop Deshaucios," Stop Evictions, social movement during a protest to prevent an eviction in Oviedo, northern Spain on June 27, 2012. Protesters tried to prevent the eviction of an Ecuadorian family unable to maintain its mortgage payments in Oviedo, northern Spain. Jorge Cordero, his wife Patricia and five-month-old daughter Amanda were evicted because they could not keep up mortgage payments to the Cajastur bank. Seventeen people locked themselves in the apartment with the owner and around 200 people gathered outside to try and stop the eviction. Jorge's wife and baby daughter were not present in the apartment during the eviction. Twenty people were arrested. The plight of over one million Spanish people facing a crippling mortgage debt is increasingly attracting public support as an anti-eviction movement places pressure on politicians to act. 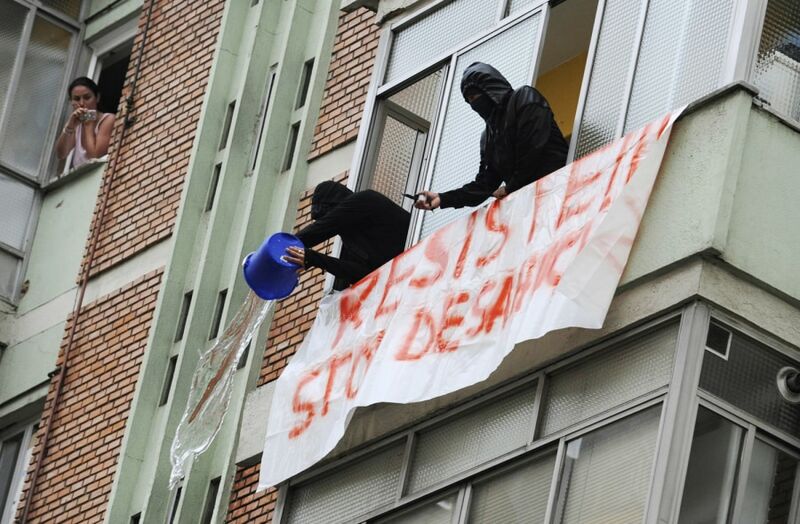 Activists from the "Stop Deshaucios," Stop Evictions, social movement throw buckets of water from a balcony to prevent police entry during a forced eviction. 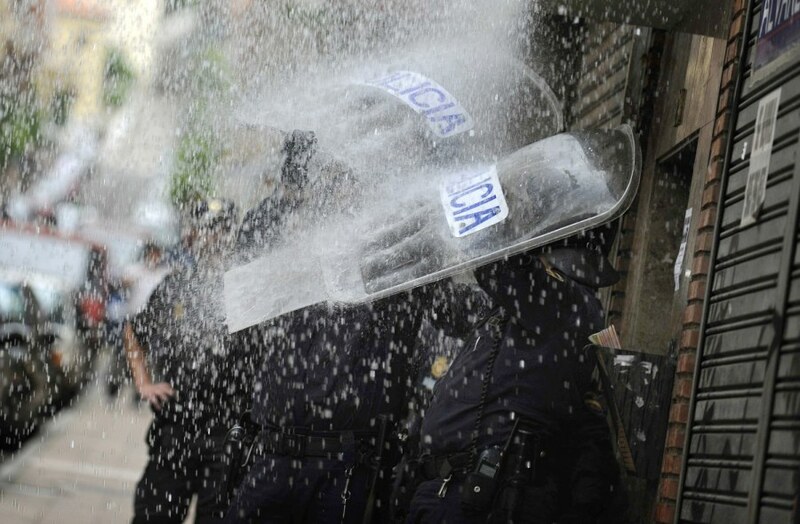 Riot police take cover from water thrown from balconies by protesters of an anti-eviction social movement. 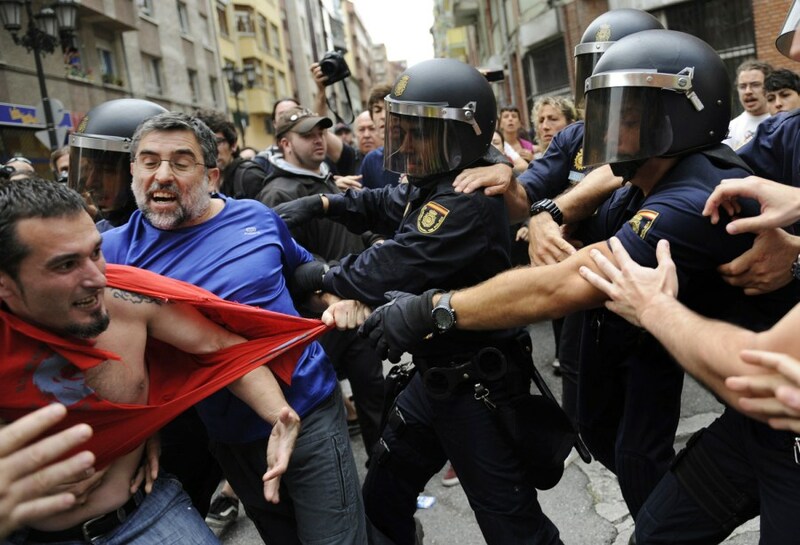 Spanish riot police restrain a member of the "Stop Deshaucios," Stop Evictions, social movement during a protest to prevent an eviction in Oviedo.